Dedicated to the health of our school and community, the SHS Natatorium offers a wide range of aquatic activities for all ages. Pool fitness equipment is public accessible: Pull buoy’s - for arm exercise isolation and stroke definition. Kick boards - for leg exercise isolation and developing a strong kick. Water weights and pool noodles for stretching and fitness development. 83* ambient regulated heat and humidity temperature via our new state of the art Hydro ceiling fan. Indoor heated lap pool and diving well. Come Join in the FUN at the Steubenville Natatorium! 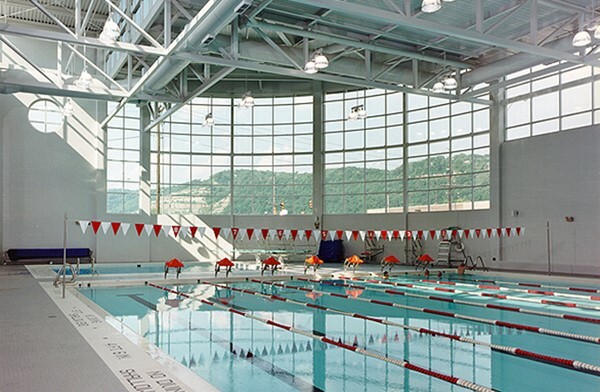 These fees include the use of the pool, aerobic equipment, Crimson Center fitness equipment and our indoor track. Group rates are available upon request. **Track is closed during all practices and games. Fitness Area is closed during all sports games and Banquets. Pool is closed during all evening swim meets. The facility is located on the North side of the high school at the corner of Logan and Route 7. It is a public, heated lap pool with an open area to walk and exercise. It also includes a diving well with a 12 ft. depth. We operate yearlong in conjunction with the Steubenville High School calendar during the school year.